I am currently sat at my dining room table, watching the most amazing video, taken by the awesome PinkOddy, of this years danceathon on a cracked i-phone screen. Completely cracked screen, top to bottom. This crack was a result of me dropping said phone, as it was ringing, trying to answer it, whilst holding Little Miss wrestler-style under one arm, and simultaneously trying to prevent The Boy with the other arm from stepping in front of an oncoming cyclist. As a parent I am sure I am not alone in this. I have heard frequent tales of toddlers just “giving the i-pad a bath Mummy” or hurling a much loved tablet, ninja-style, frisbeeing towards the nearest wall. I also have one friend, who shall remain nameless, whose child decided to flush her i-phone 5 away as he wanted to see where it would end up. So is it time for a new phone? I am not due an upgrade any time soon and I am thinking this might be a little costly. Apparently there is an alternative. For approximately £60 I could have the screen replaced. 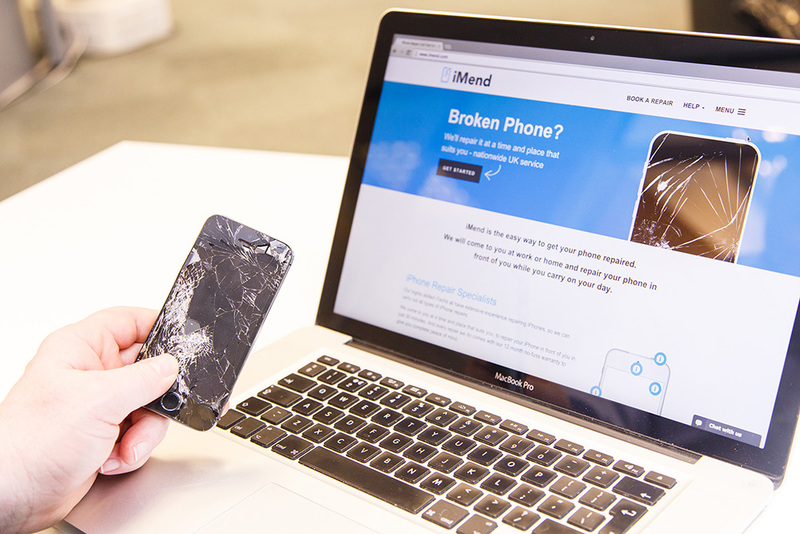 iMend.com offer both a call out service, or if you prefer, you can mail in your phone to them and one of their super-techy team will work their magic and have you up and running again. Cheaper than a new phone hey? 3. Your local iTech will contact you to confirm your appointment. iTechs will repair your phone at a time and place convenient for you. They will come to your office, home, or any location to suit and will fix your phone in about 30 minutes while you carry on with your day. 4. No Fix, No Fee. Once your device is repaired and you are 100% satisfied you then pay the iTech for the repair. And it would be nice to watch this on a non-cracked screen. It is also not too late to add your sponsorship. Disclosure: This post is brought to you in association with iMend.com but all words are my own. Oh dear! I am accident prone too when it comes to my iPhone. I badgered Al for one for months on end and when it arrived I legged it straight out to Paperchase and bought a girly geometric trendy cover. Got home, put it on the phone, dropped it on the garden path and gave it a dent to the side. So then I got a lifeproof case which cost nigh on £100 but now means I can drop it – even down the loo – without breaking it. Ok it looks like a brick but it’s safe… and Papasaurus can’t see that I dented it 😉 Mums the word! Ooh that is worth knowing as we are often breaking things in this house. I am ashamed to say that I am always dropping my iPhone – over the years I have had more screens replaced than I care to remember!! I bought a waterproof phone, but sadly the waterproof plug on the adaptor hole fell off. So it didn’t survive swimming in the toilet 🙁 Glad to hear about this, all my phone accidents have involved water so far, but you never know! Touch wood my phones have always been ok, but my OH has lost 3 by dropping them in the loo, and my teen has cracked iphone screens twice!